How to set up an Automated Webinar? ezTalks supports live webinar, automated webinar and on-demand webinar. 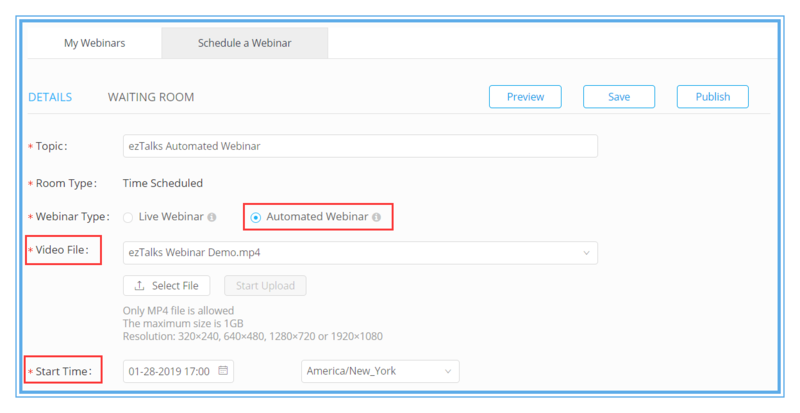 In an automated webinar, you can set a particular time for your webinar to automatically start. In an on-demand webinar, your participants can watch the webinar at any time. Here is a guide about how to set up an automated webinar. Step 1 Sign in your ezTalks account from the user center. Choose the starting time of your webinar, when the webinar will be automatically started. Step 4 Then you can turn on the registration if you need to collect the participants' info. And you can make it a paid webinar or free webinar according to your requirements. Step 5 Continue to finish the other sections of Waiting Room, Registration and Thank You Page. You can refer to the Quick Start Guide to schedule a webinar. Step 6 After you publish the webinar, you can send the registration link or webinar link without registration to your participants. Here is a guide about how to invite participants. After everything is set up, the webinar will be started automatically at scheduled time. If the host wants to join the webinar, he/she can join as a participant by clicking on the webinar link. How to start a webinar? How to join a webinar? How to set up an on-demand webinar?